Would you rather your kindergarten-age child had blood lead levels 3 times the safe limit (like children living next to a lead smelters – double the level of most kids with lead toxicity), or would your rather your child snored? The impact on the brain is about the same, according to a provocative study in the October 2004 Journal of Pediatrics. Sleep-disordered breathing (SDB) is the name given to a spectrum of sleep breathing patterns ranging from mild snoring to obstructive sleep apnea. In this study of more than 200 children, those with SDB scored significantly worse on tests of behavior, memory, intelligence, and ADHD than did their peers – even if they only had snoring without sleep apnea. Given the poor scores on wide variety of tests, it’s not surprising that their school performance also suffered. Thankfully, treating snoring at this age seems to improve performance. The authors suggest that 3 to 6 years old is the peak period where snoring is harmful to development, and also the peak age at which treating snoring can make a big difference in behavior and learning. Overall, about 1 in 10 children this age snore. Where do you go to get it treated or tested? My son’s pediatric doctor has not been very helpful with this saying he’ll probably grow out of it. He not only snores occasionally but frequently grinds his teeth at night. I have a hard time sleeping when he does it. 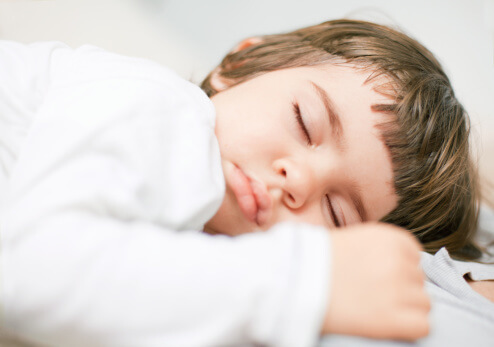 When children snore, it is common for a doctor to prescribe a sleep study. This is an overnight test in a testing center. Here is more information about Sleep Studies for Children. After this is done, the doctors will be able to tell what kind of treatment your son needs, if any. If you are interested, ask your child’s doctor to prescribe a sleep study.